The purchase price and running costs of Cabin Commuters are so overwhelmingly advantageous that they would noticeably reduce humanity’s impact on Planet Earth. 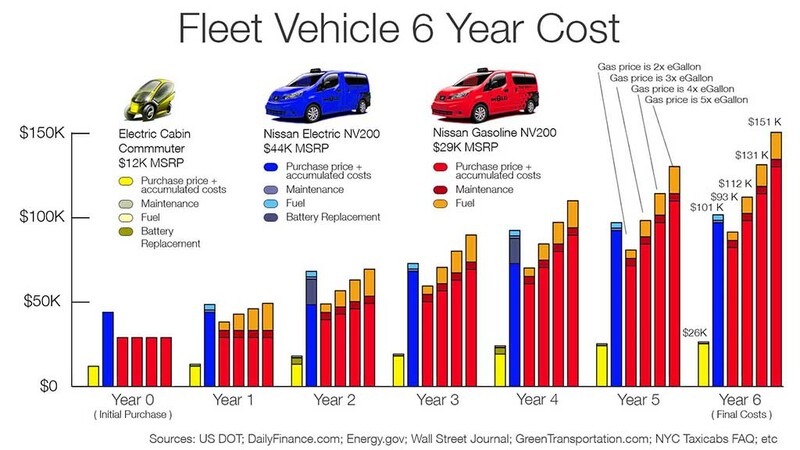 Start by taking a look at how the purchase and running costs of an electric Cabin Commuter stack up against those costs for full size electric and gas vehicles that we discussed in the previous section. If you want to know what the economy of this minimal platform does to the economics of shared transportation, take a look at this payoff chart. This is the exact same chart I showed you earlier in the Uber Will Change the World section except that the Cabin Commuter has been added in. This is the payoff period for a Cabin Commuters with fully amortized and mature autonomous technology manufactured in huge quantities. 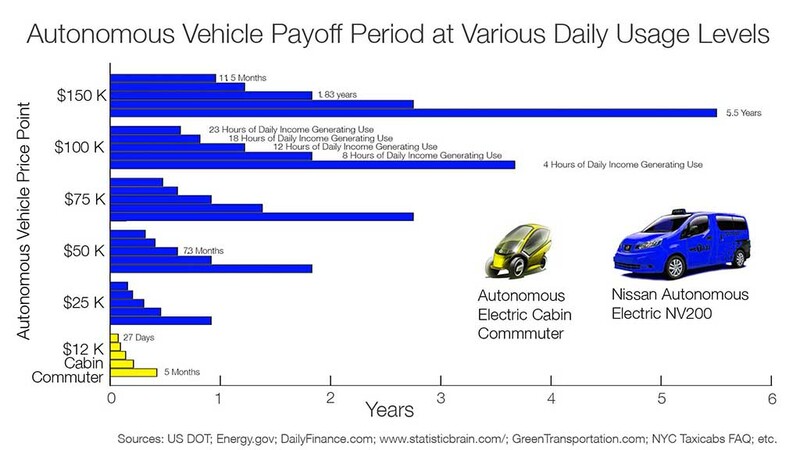 If an autonomous Cabin Commuters is put to work 23 hours/day it would pay itself off in 27 days. Even if it was only used four hours/day it would still be paid off in five months. Even with minimal usage it would still spend five and a half years of its useful life just generating profit relative to the human labor rate. If anyone’s curious to know what this does to the price of transportation through The Mobility Cloud, take another look at the cost graph I showed you previously in the The Mobility Cloud section. 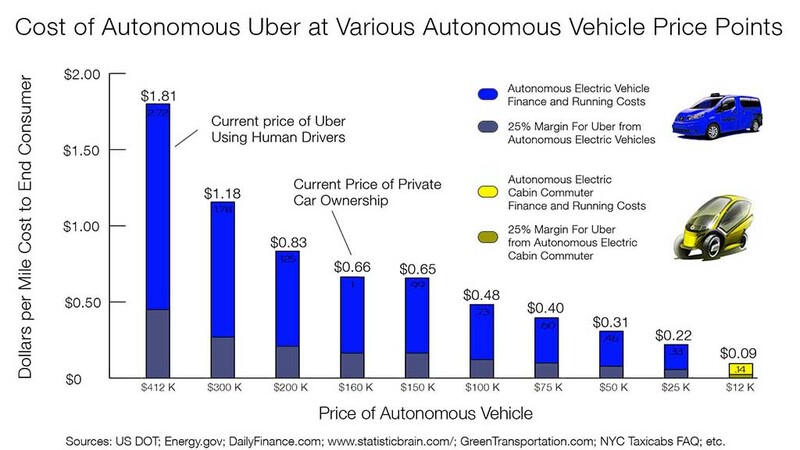 This graph shows us that using a technologically mature, mass produced autonomous Cabin Commuter could reduce transportation costs below ten cents/mile. That’s roughly an 85% decrease in the price of transportation relative to private car ownership. By my calculations that’s about three trillion dollars of disposable income saved just in America. Imagine what consumers could do with all those freed up funds. Finally, if Uber and its ridesharing competitors reduce the price of wheeled transportation by 85% relative to the current price of privately owned cars through The Mobility Cloud, what do you think that’s going to do to the global market for transportation? There’s going to be billions of new customers for transportation in the developing world, and 75% of these new customers are going to be riding around in Cabin Commuters. So we could debate all day long about consumer choice and marketing and will Americans really accept riding in these small Cabin Commuter vehicles, but at the end of the day, the underlying physics, which will create the macroeconomic forces that will drive consumer choice, combined with the point to point convenience of these vehicles, all ensure that these Cabin Commuters cannot be beaten by any other mode of transportation, even public transportation. That’s why this humble little machine will be the Walkman and the iPhone and the Facebook of the coming autonomous vehicle revolution.